In the pages of this guide, I will discuss the basic homeschool planner types and which of my printable forms each planner type might use. A planner is no good unless it works for you so I hope you will gather enough information from this guide to assemble a homeschool planner that does. You should think about what kind of planner might best suit you. If you are not sure, choose one of the four basic planner types to use this year, and by the end of the year, you will know more about how you manage your homeschool days and the forms that you found most useful. The links below go to the four basic types of Home School Planner Books. 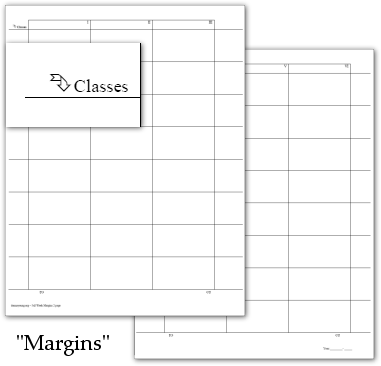 Planner types can mix and none are carved in stone. You should take ideas from these lesson planner types to create a home school planner book that you find encouraging to use. Focus - Having weekly lesson plans in all subjects written in a weekly planner form for each week. Focus - Planning ahead of time for each subject for as much as the entire year. Lessons are checked off as they are completed. Focus: Keeping a daily or weekly record of your children's homeschool activities and work in prose. Focus: Making a daily schedule of lesson plans that are laid out in order, out of order, or in chunks of time. In the article Essential Homeschool Planner Forms I have described some of the homeschool forms that seemed essential to me. However, what is essential for a homeschool planner is relative and you will decide what is essential for your planner. Despite the aforementioned essentiality of my list of essential forms, Essential Homeschool Planner Forms exists to give you a start. Each type of form is briefly described and linked to the page from where the form may be printed. I didn't cover adding household forms in the articles linked above, but if you need to add household forms to your homeschool planner, I encourage you to do so. If you haven't found my household forms, they begin at Household Planners at DonnaYoung.org. 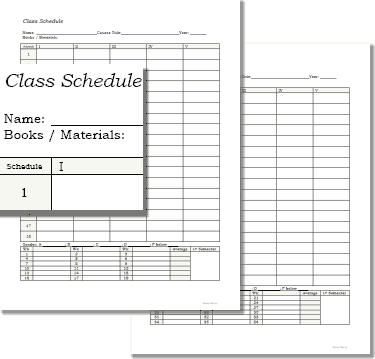 Not only do I have an entire section of household planner printable files, two of my coordinated homeschool planner sets include household forms. Despite the hoopla of me making coordinated homeschool planners, THIS calendar, pictured above or left, is The Most Favorite Household Notebook Calendar layout. This calendar may be printed from Dated Block Household Planner. Before you print this notebook calendar, be sure to look at some of my other organizers in the Calendars section starting at Organizers and Journals.